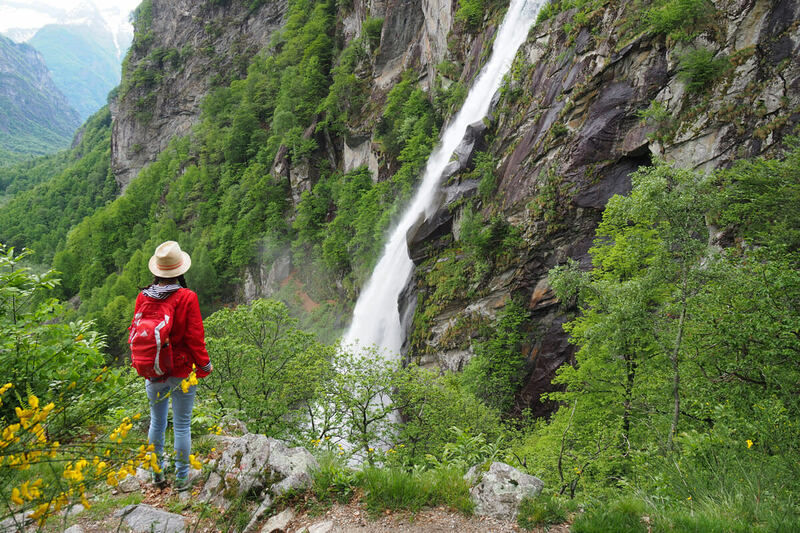 The Foroglio waterfall is located in one of Ticino's most remote valleys, and it is truly something else. In Bignasco, the crowd has thinned and the transfer onto a yellow postal bus is much smoother. The Bavona Valley branches off to the northwest and our ride takes only another fifteen minutes. 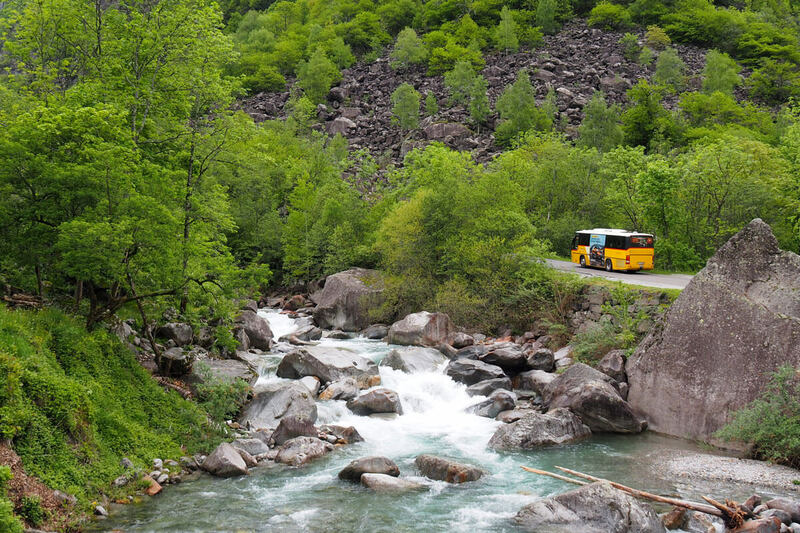 That last stretch is especially memorable, as the valley slopes are untamed and the River Bavona gushes relentlessly. 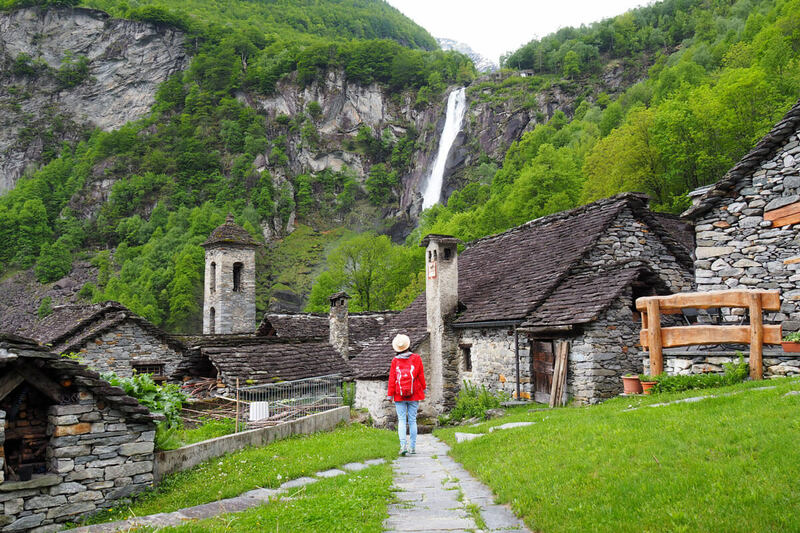 We spot more than a handful of waterfalls while passing a couple of villages with town signs that read *Fontana" or "Ritorto". 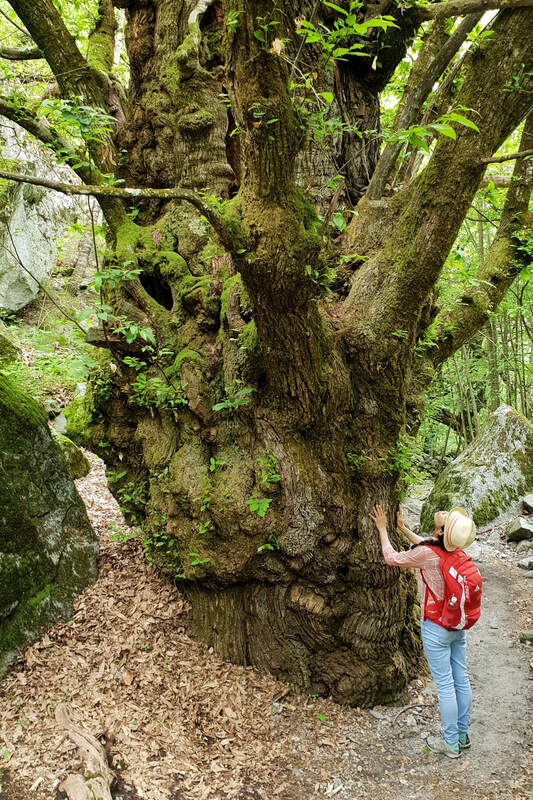 Foroglio is a destination for nature lovers. 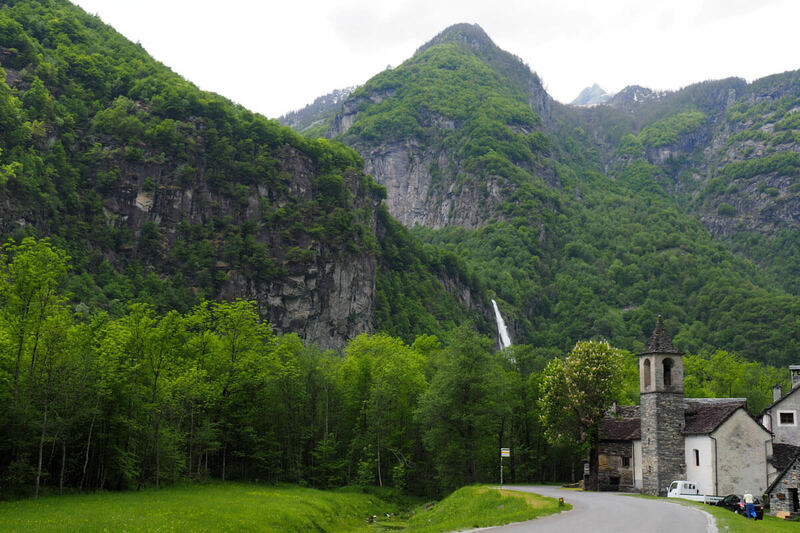 The famous waterfall of Foroglio is a mesmerizing 100 meters tall as seen from the valley floor. Quite literally, it is awesome to witness the masses of water in free fall, which explode into a cloud of mist upon impact on the cliff. 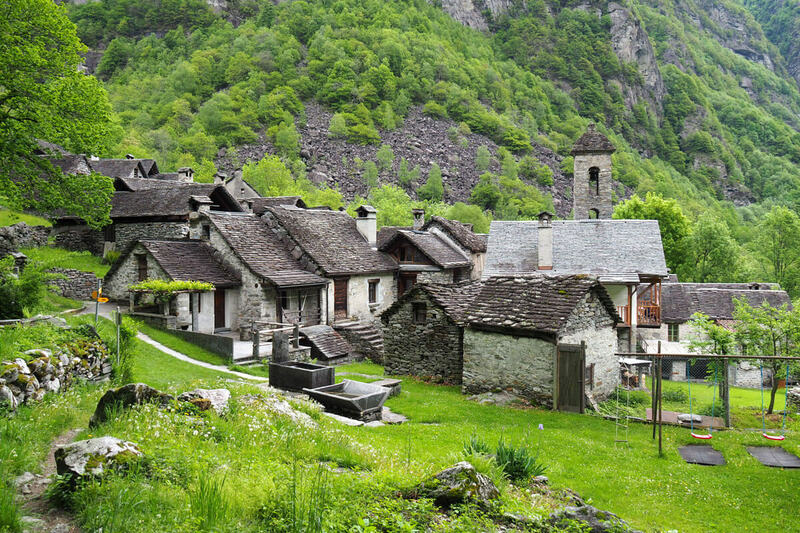 Due to its spatial distance from the nearest proper town, Foroglio is tucked away from modern society. It is off the electric grid, too, and looks as if it were stuck in time. 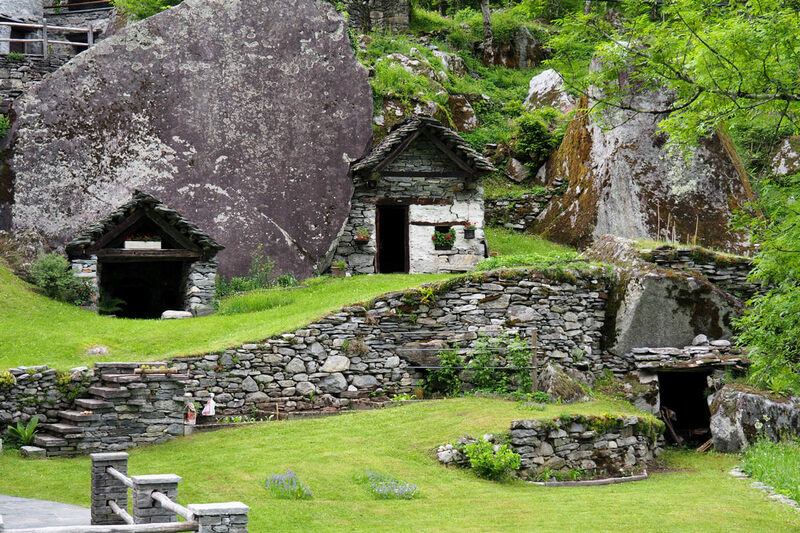 But these types of stone houses are actually very much typical for the canton of Ticino, and remoteness is a given around here. 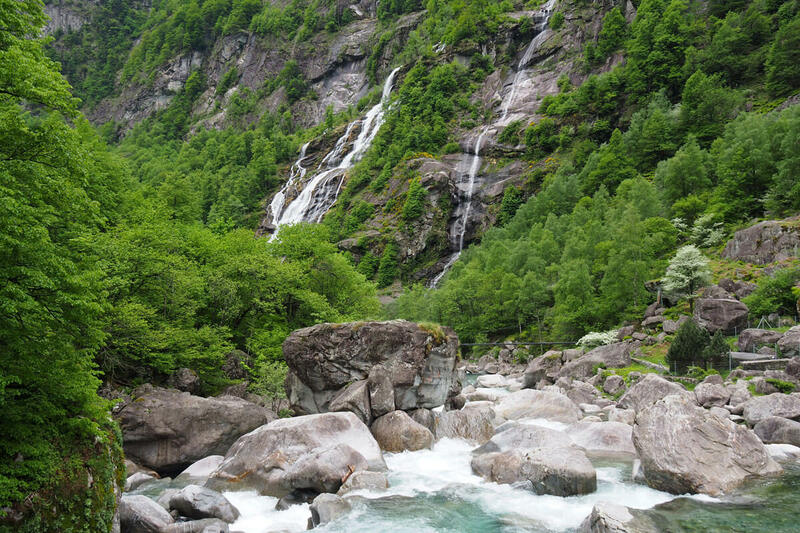 Watch this record jump off a Ticino waterfall! 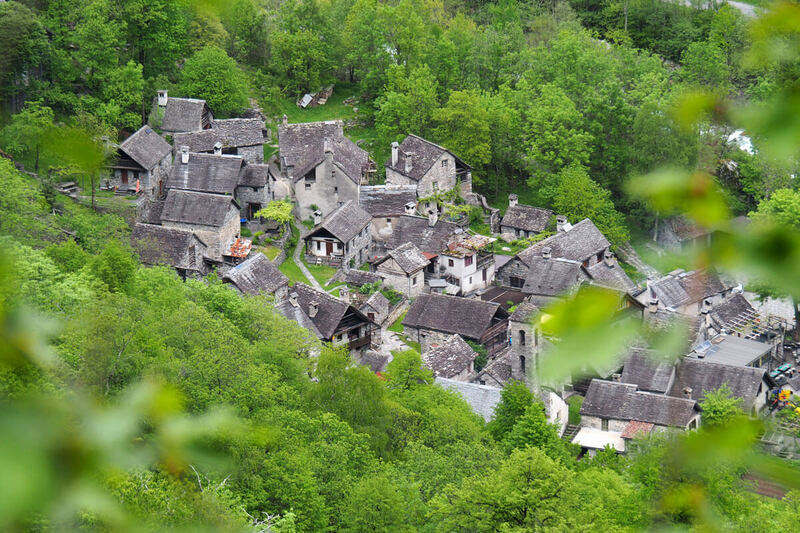 Nonetheless, as we crisscross the picturesque village, we feel strongly that Foroglio deserves to be protected from any future development. UNESCO, are you reading this? First, we want to get up close and personal with this most beautiful waterfall. 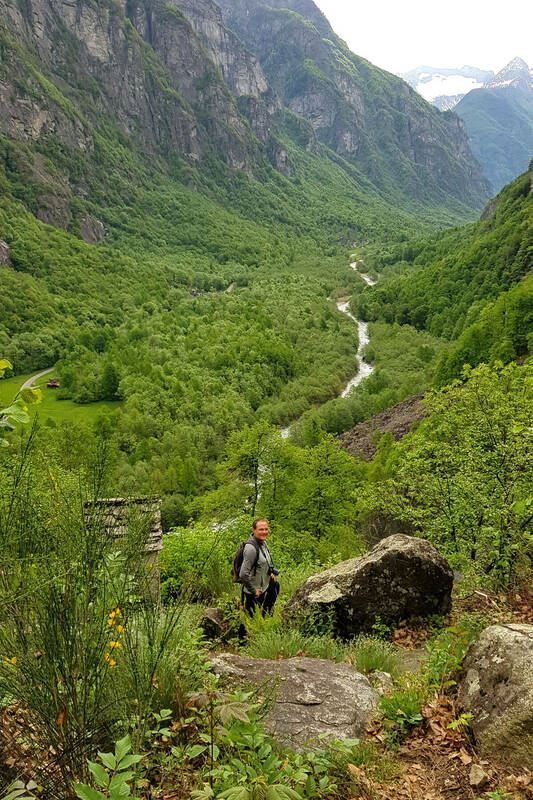 A hiking path exits the village at its highest spot, climbing up through a lofty forest and across little creeks. In some parts of the world, they would call this a National Park. But here in Switzerland, they just call it a valley. 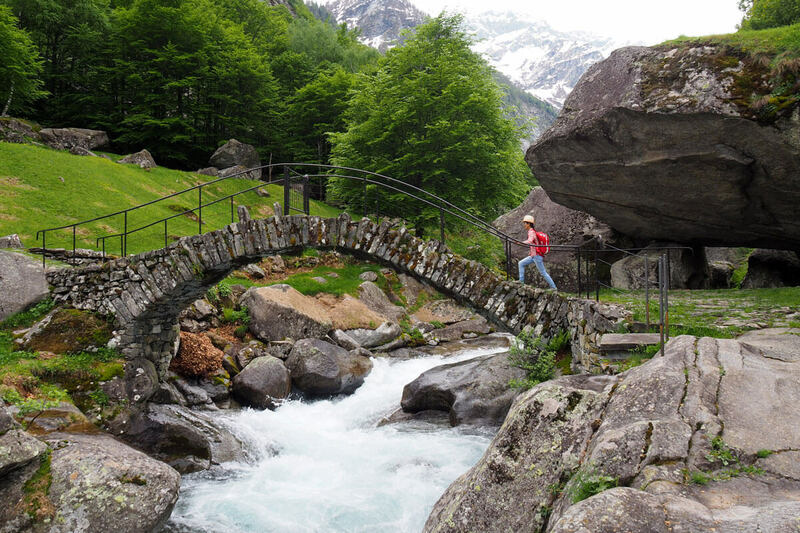 Our lunch reservation is at Foroglio's only restaurant, a typical Ticino grotto called La Froda which has been in operation since 1928. 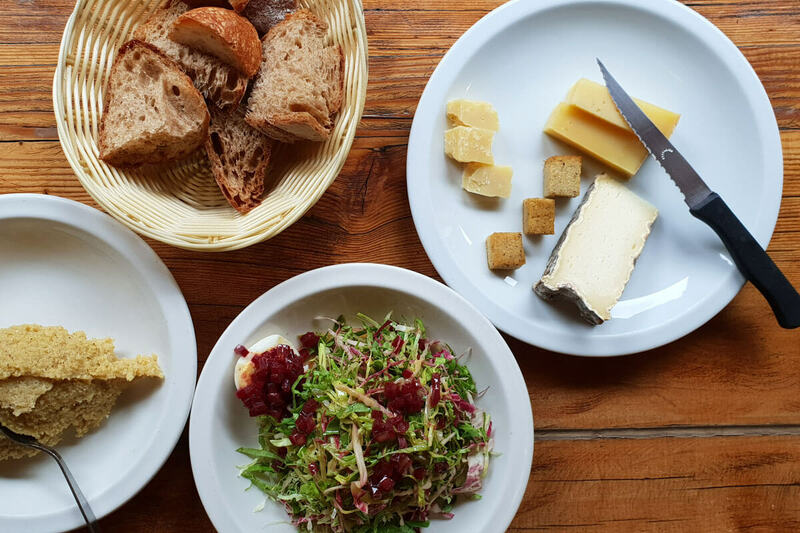 On the menu at La Froda is local cheese from the Maggia Valley (fresh and aged varieties), polenta (a type of boiled cornmeal), codighe pork sausages, salami, pasta and a mixed salad. We fill our bellies, embrace the rustic setting of the restaurant and look at the waterfall one more time. Then, we hike back towards Bignasco. 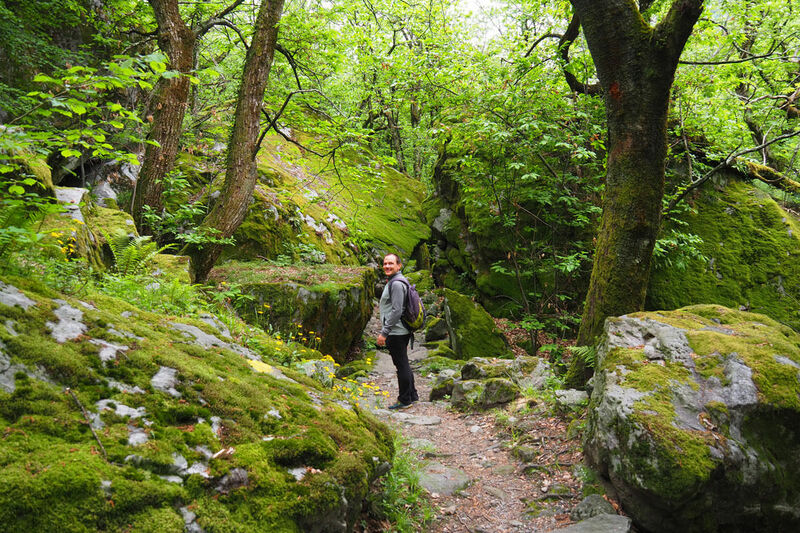 May and June is the perfect time of the year for this hike. Expect some sprinkles of rain, but this is what it is like being part of nature. And with all this moisture in the air, the moss covered rocks have turned as soft as a cushion. Also, we walk part of the way on sand banks, an interesting tactile experience considering that we are in Switzerland. Ferns are thriving in the shaded areas, while meadows are strewn with wild herbs and blooming flowers. Are these living quarters for gnomes? 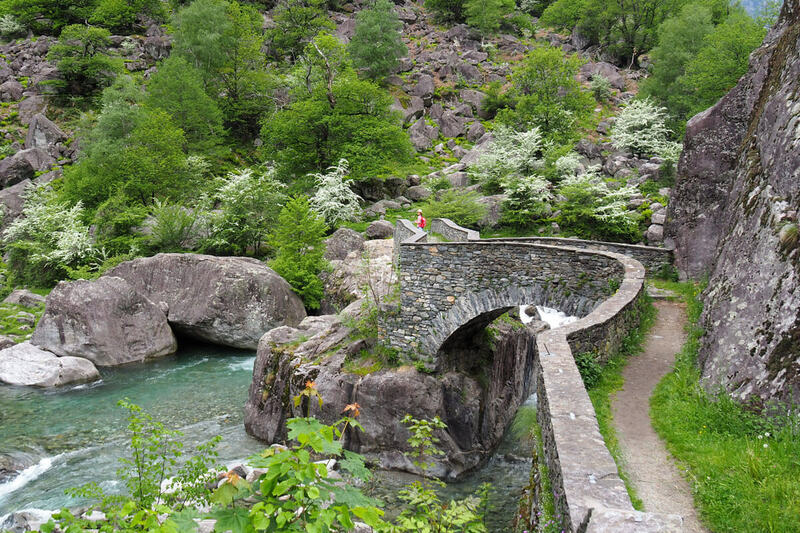 Before we catch the 4:07 PM postal bus headed for Bignasco, we check out one final highlight in Fontana: A zig-zag brigde with a view so mesmerizing, you will just have to go and see for yourself! 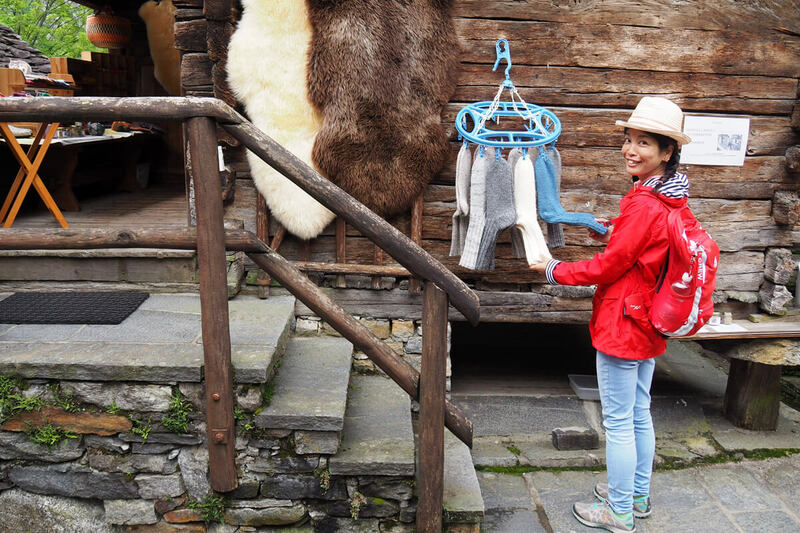 One final piece of advice: Don't forget to greet fellow hikers with a smile and a "buongiorno!"